Located in an area known as "Canada's Deep South," and surrounded on two sides by the moderating waters of Lake Erie, Point Pelee National Park boasts one of the warmest climates in Canada. Though relatively small, it contains several diverse environments and hosts more visitors than many larger parks. Like many Canadian geological features, Point Pelee exist as a result of the Ice Age. Approximately 10,000 years ago, glacial melt waters deposited sand on a ridge extending across the bottom of Lake Erie. Currents, winds, and waves shaped the resulting point. Scholars believe that by 500 A.D. Indians lived in the area. Europeans first discovered the point in 1670. The federal government created a national park in the region in 1918 to preserve its many unique features. Much of the flora and fauna there, while common in the United States, reach their northern limit in the area and appear nowhere else in Canada. A forest of the Carolinian type survives there, but the typical Canadian evergreen is difficult to find. Reptiles and amphibians thrive in the park, whereas cold often restricts them in other parts of the country. Despite the park's many other unique features, it has perhaps gained its greatest renown as a mecca for bird-watchers. About ninety species nest in the park and hundreds more migrate through it. Observers have spotted at least 336 species there. Point Pelee attracts birds not only because of its warm climate and diverse habitats but also because it is the easiest location from which to cross Lake Erie. The point just far into the lake, and nearby lies a chain of islands that lead to the far side. So superior is this migration route across Lake Erie to other pathways, that even monarch butterflies use it when flying to Mexico. 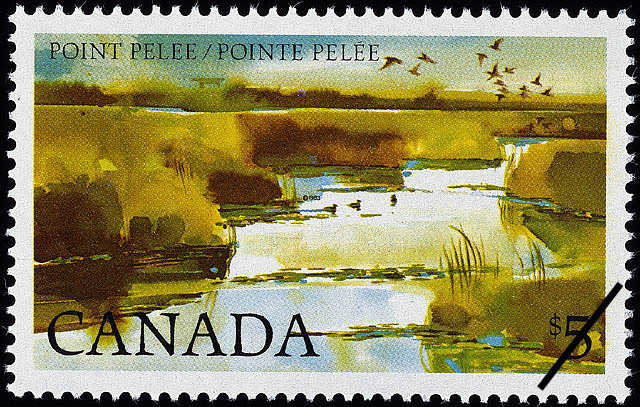 The marshy terrain of Point Pelee, with its lush summer vegetation, has been faithfully rendered by artist Wayne Terry, using an appropriate watercolour technique. Typography is by William Tibbles.